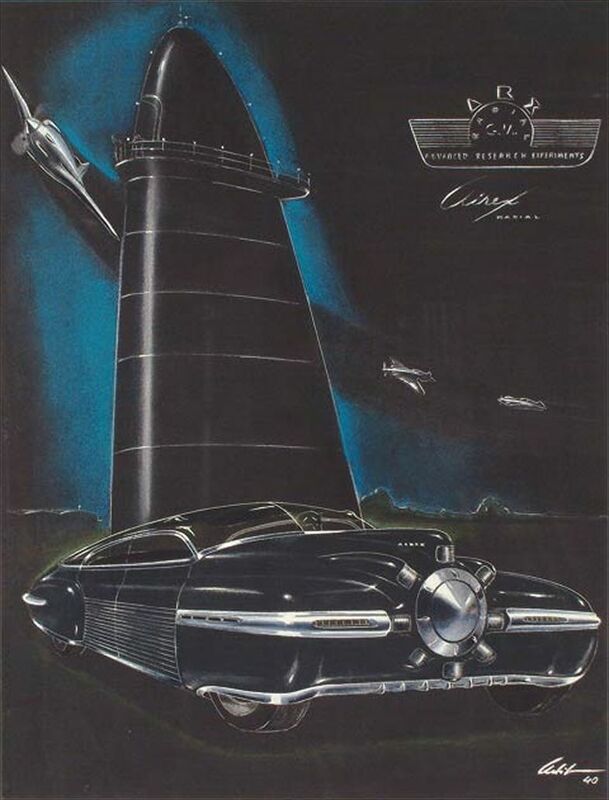 The 1950s saw the emergence of a design style, Virgil Exner and Harley Earl evidenced, if it can be considered as a visual naive today there is still a profound influence on our perception of future opportunities. The 1956 Motorama was an important showcase for this style of design that lasted until the early '70s, the most characteristic is the human interpretation of the function as dictated by the form. The last great examples of this period are: Coca-Cola bottle and the Corvette Mako Shark, now revered as works of art by connoisseurs, their price reflects their stature in the world today. All these sketches give the perception of the flow of air over the metal, mind seen as a virtual wind tunnel. First aircraft around the tower and this black beauty to the front is a straight out of an aircraft radial engine. Unfortunately, there is no propeller. The bumper is discreet. The similarities between the P-38 Lightning and the automobile are obvious. The futuristic plane flies over. The number 9 on the pontoons of the car suggests the possibility of a new cylinder engine. 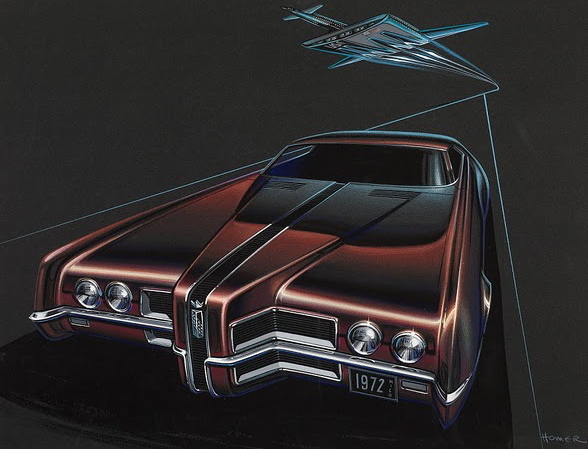 Two sketches made by Richard Arbib, during his brief career with General Motors. Inspired by a design by George Lawson for Tucker. 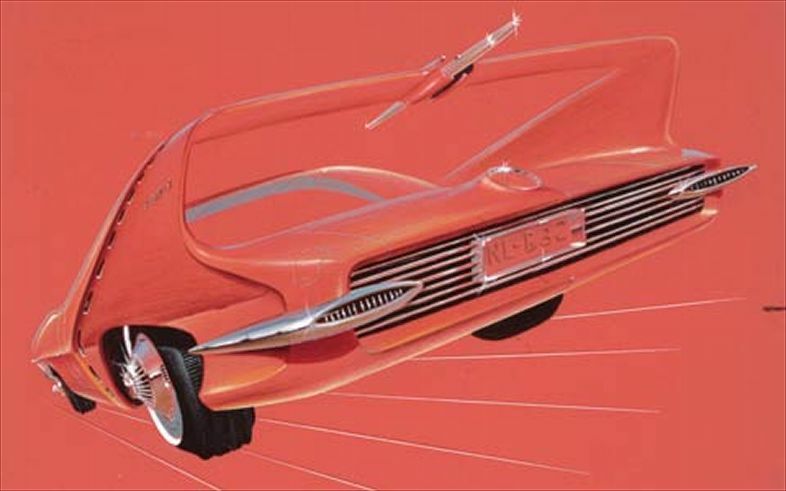 It rendering all in roundnesses was to predict the future evolution of car design Chrysler. 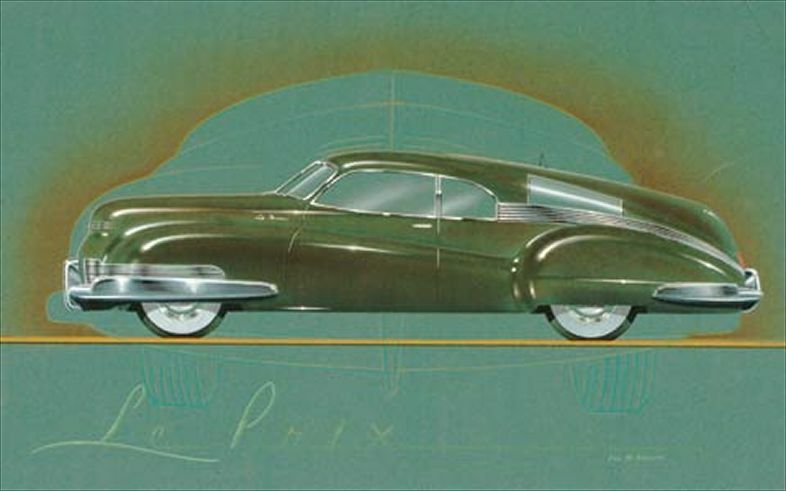 Arthur Ross has designed this car Buick Circa with impressive curves for General Motors. 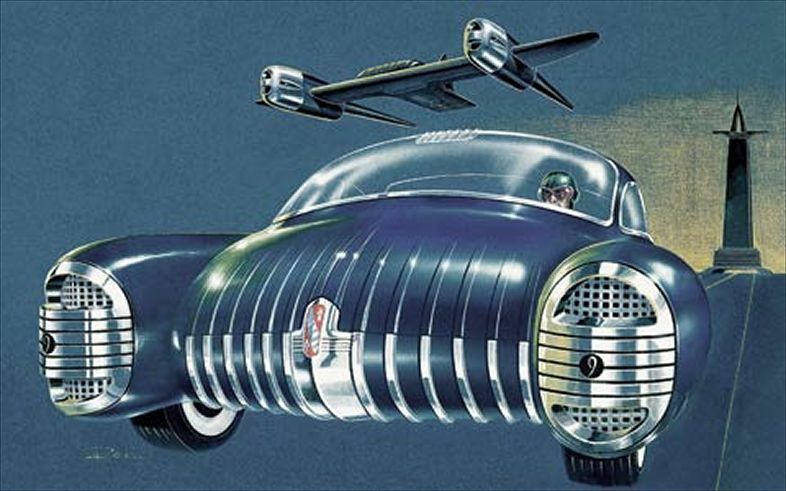 It was a futuristic sports coupe, a proposal by the end of the Second World War. 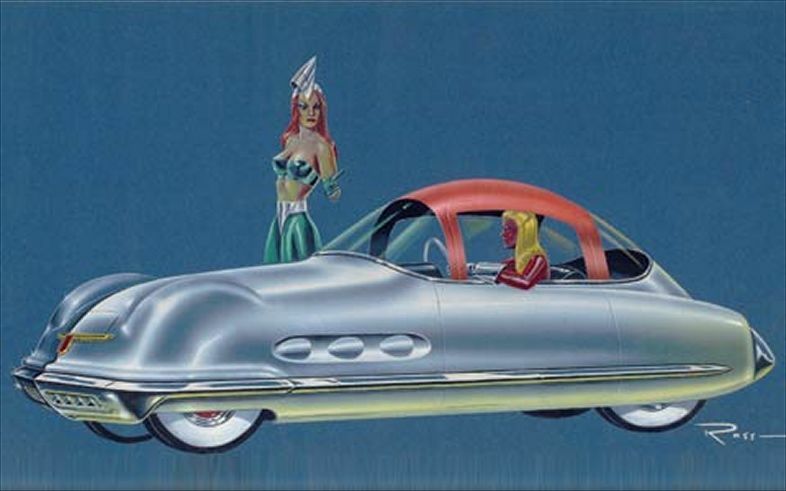 The port of helmets and possibly protection against stray missiles, two riders can enjoy this Buick double cockpit, a feature popular design during the 1950s. The interesting style includes an oval winged grille on the hood of the air intakes, and a calender four headlights become a standard in the industry after 1957. Gills in the wings, the omnipresence of the 1950s, the wings shaped fins and a fin forming the junction. 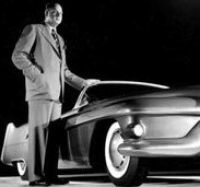 The scandalous vision Milt Antonick, which appear later on the Plymouth Roadrunner Superbird. 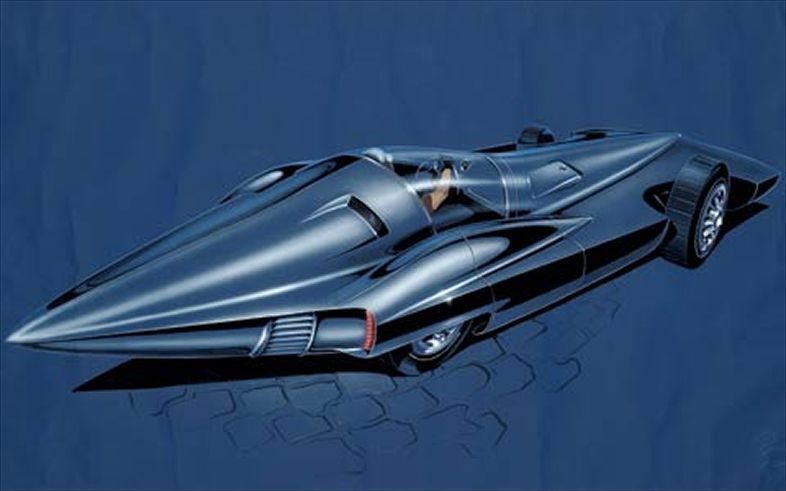 The design of the Ford Motor Company gyrostabilized Giron was probably nearing completion when Syd Mead created this sketch. Ford has not built a working prototype for the auto show circuit the Giron made â€‹â€‹its public debut at the New York Auto International in 1961. Unfortunately, the car was destroyed in a fire. A device concocted for 007, under the leadership of Bob Hubbach. 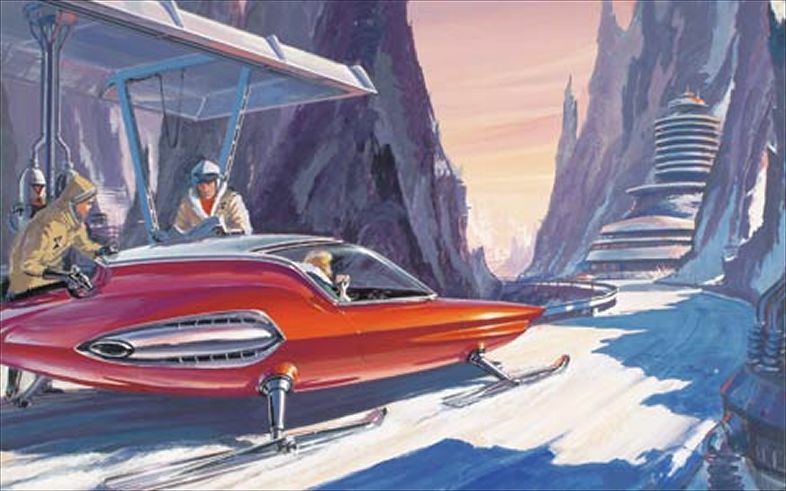 The car jet ski on its way to a destination futuristic mountain. No concerns of traction when you jet power behind you. 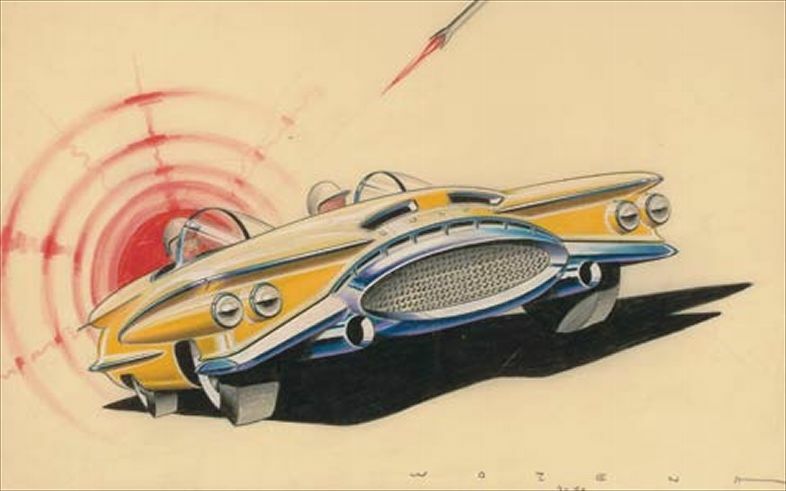 The artist Elia Roussimoff, says he created this sketch Turbines Vehicle Wild, just to decorate the walls of the design studio of General Motors. 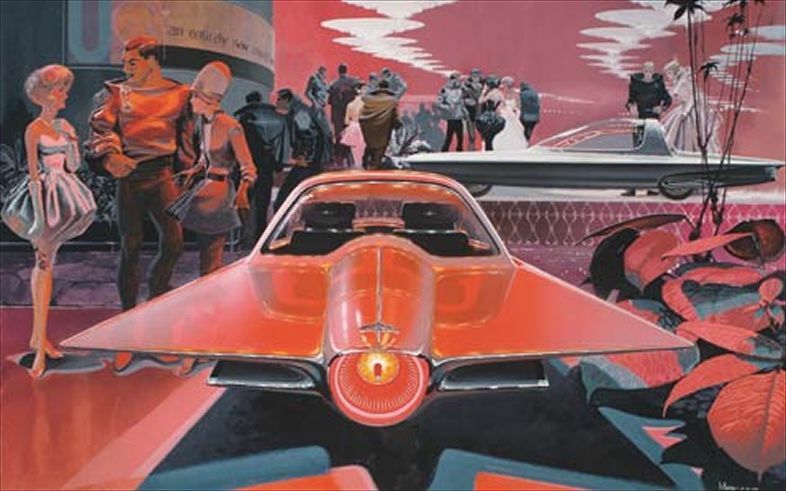 A Disney animated short, which presents visions for the future of road transport, circa 1958. Of course, some ideas concepts seem a bit naive and idealistic, even self-contradiction, others just downright crazy, but a lot of ideas in this short film have already become commonplace, and many more are currently developing.